Crucial Compression Calf Sleeves provide you with comfortable support, where you need it most. Ultra soft and surprisingly comfortable. You may even forget you're wearing them - but your calves won't. Take advantage of modern sport technology. Now you can perform better with the same compression technology worn by professional athletes and elite runners. Don't let your aching legs hold you back. Slide your leg in and pull the sleeve up to get runner's shin splint relief and improved circulation for vericose veins, spiders, thrombosis, walking, and night leg cramps. Painful, swollen, and injured legs need extra love. Utilize compression protection to speed up your recovery. CLICK TO ADD TO CART NOW! If for any reason you are unsatisfied, just email us stating the reason you are unhappy, and you will receive a courteous and prompt refund within 24 hours. It's that simple. Don't go another day without experiencing the benefits of Crucial Compression! INSTANT SUPPORT AND RELIEF - You will feel the difference immediately. Premium Calf Compression Sleeves for fast shin splint pain relief with less swelling, soreness, and leg discomfort. Our Power Support technology improves blood circulation and heats your calf muscles, pumping more oxygen with less lactic acid build up so you can go farther, for longer, with faster recovery and less calf pain. Your legs deserve it! ULTRA COMFORTABLE FIT - Some compression calf sleeves are too tight, too hot, or impossible to put on. Our premium quality design and construction is unmatched with a surprisingly soft feel that is comfortably snug - without cutting off the circulation to your knees, ankles or feet. Calf sleeves that feel so good, you may even forget you're wearing them. "NO-SLIP" DOUBLE GRIP - Stopping to pull your sleeves back up is frustrating to say the least. With our unique Double Silicone Grip your calf compression sleeves stay in place without sliding down - no matter what you're doing. Now you're finally free to enjoy your favorite activity uninterrupted. Stop suffering and start looking and feeling great. Your legs will thank you! FEEL CONFIDENT AGAIN - Designed and proven to be beneficial for men and women who need comfortable calf support and shin splint relief. Lasting vascular support helps to relieve pain, reduce fatigue, swelling, prevent blood clots after surgery and vericose veins. 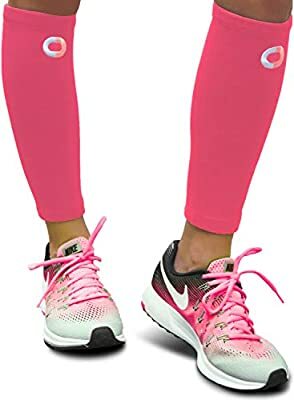 Grab a few pairs for yourself or as the perfect gift idea for runners, athletes, fitness, workout, hiking, cycling, nurses, varicose veins, edema, leg cramps, or anyone else who would love a little extra leg support! 100% "PERFECT FIT" GUARANTEE - Your comfort is our passion! Use our size chart to choose the best fit. If you are not completely satisfied with your compression sleeves, return them for a full refund or replacement. No questions asked. We stand behind the quality of our products with excellent customer care and are confident you will LOVE your calf sleeves.